Use this section to find out about the BSA Program, and the degree to which Troop 340 embraces the way it "ought to be". 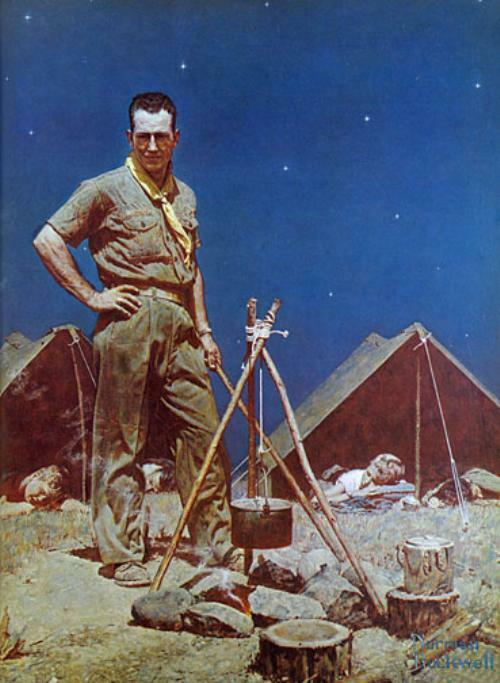 I wasn't a Scout as a boy, can I be a Scout Leader? All are welcome to contribute as much as they can as a uniformed leader, Committee Member, Merit Badge Counselor (MBC), or as an active parent. As a Committee Member, you should be willing to attend monthly Committee Meetings and get involved in as much/little upcoming activities as you wish. As a Merit Badge Counselor, you choose to provide counseling from 1 to many of the available 121 Merit Badges. YOU DO NOT need to be an "expert" to be a counselor, as the $4-5 handbooks will cover ALL that you need to know to learn/teach each particular badge. As a Merit Badge Counselor, your time is ONLY used "upon request" when a Scout decides he would like to work on a particular badge for which you've agreed to be a counselor. 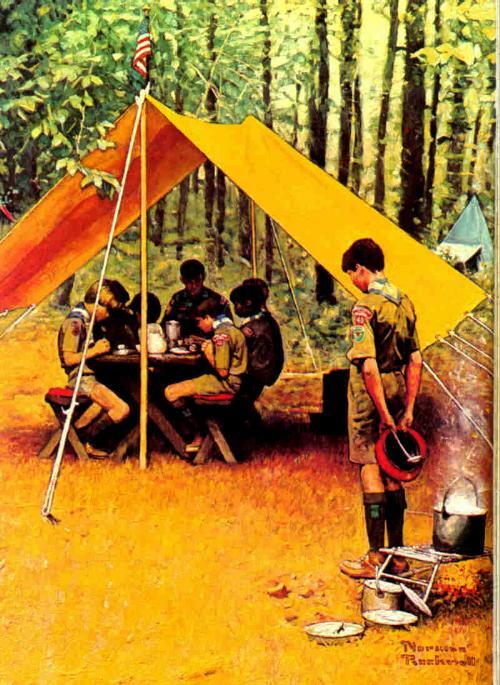 Merit Badges are earned OUTSIDE of the weekly meeting, so Scouts meet with you ON YOUR SCHEDULE of availability. All leaders MUST complete a BSA Adult Application, which requires you to provide your Social Security Number. A background check will be done by the Baltimore Area Council. If you do not provide your SSN, you will not be accepted as a leader. This is National BSA policy and not the policy of Troop 340. The Troop charges an annual membership fee. At this time that is $100. There will be modest "food charges" for each monthly camping trip or outing, and a charge each year if your son attends week-long Summer Camp (highly encouraged!). Fund Raisers are held as needed to fund new equipment, and more elaborate camping destinations. The membership fee - helps to pay for annual registration, Boy's Life Magazine subscription, numerous awards, badges, pins, camp ground fees, and more. It usually is NOT enough for all expenses (see fund raising below). Camping "camp fee" (food charges). Each patrol creates their own menu for monthly camping trips and can decide to raise or lower this charge to align with their menu choices. TYPICALLY, this should be $10-$15 each trip. Summer Camp Fee - Week-long Summer Camp is a great experience, and we encourage Scouts to attend every year. The average fee is $360. Fund Raising - held as needed to supplement the cost of running the Troop. Covers new/replacement equipment (tents, stoves, cook gear, fuel tanks, etc), or to cover the cost of more elaborate camping destinations. Where can I buy uniforms and required patches? You may purchase the needed uniforms and patches at the Baltimore Scout Shop. At minimum, you will need a scout shirt, pants, Baltimore Area council patch, world scouting emblem, green shoulder loops and green troop numerals 340. 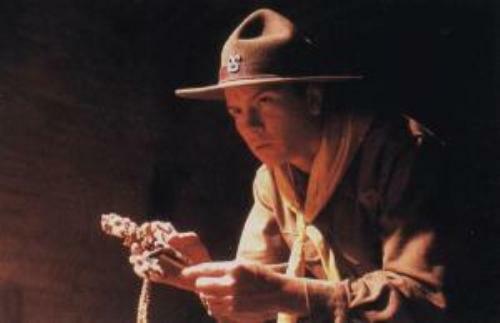 What do I keep hearing about Scouting and Religion? Scouting does NOT promote any denomination above another and works with organized religions to offer awards (officially known as the Religious Emblem Program) to any boys choosing to further explore their religious faith, from Catholic, to Muslim, to Judiasm, to Budist. Again, Scouting proves itself to be SUPPORTIVE of diversity and religious differences. The Boy Scouts of America Program is a 100 year old, professionally crafted, program of education and character development. By using the "Outdoor Method" (camping, fishing, rock climbing, etc) boys work together to do "the things boys like to do". In the process, they learn the value of teamwork, honesty, communication, mutual respect, and more as they work toward their goal and overcome any obstacles they encounter. By employing the Methods of Scouting, we reinforce the AIMS of Scouting, which are reflected in our Oath and Law. The goal is to see that they become permanent fixtures in the character of each Boy Scout as we teach them to be Trustworthy, Loyal, Helpful, Friendly, Courteous, Kind, Obedient, Cheerful, Thrift, Brave, Clean, and Reverent. What "age limits" exist in the Boy Scout program? Day before 18th birthday - the last day you are a Boy Scout. PRIOR to his birthday, all work (rank and badges) must be DONE. The Eagle Board of Review can occur after the 18th birthday, but work/project must be done PRIOR to the 18th birthday. There are NO age requirements for ANY merit badges or youth leadership positions (other than JASM and Camp Staff). 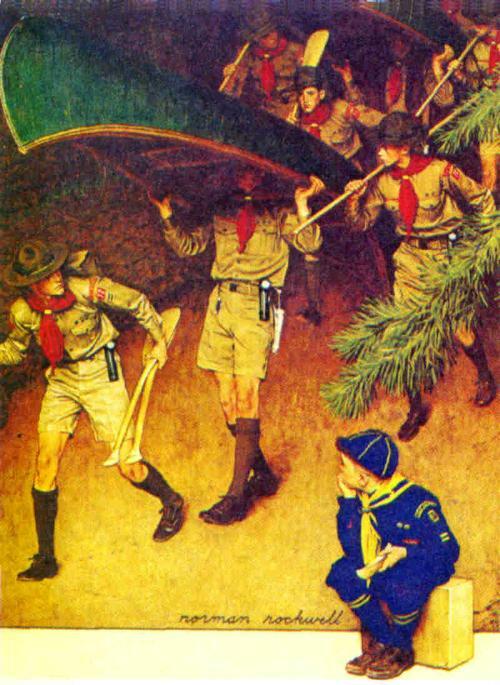 When a boy joins Scouting, his first POSITION is "Scout". We won't send the "Scout Police" out to find you if you don't show up, but you miss out on a big part of the BSA Program if you don't attend regularly. A boy who shows up sporadically DEPRIVES himself of the chance to make key decisions within his patrol; choose trip ideas and destinations, make menu selections, divvy out workload, and build close friendships. Every meeting includes a period of valuable skill instruction and fun inter-patrol competitions that relate to the upcoming camping trip. If a boys misses a meeting, he will find himself less prepared for the upcoming weekend in the outdoors. The troop meetings are where we "learn", but the camping trip is where we reinforce the skills by putting them into practical use. Why would a unit try to recreate a 100 year old Program that is already perfected? That is a good question. You should ask them. Through his Patrol Leader, he should voice his desire for trip destinations, activities, and opportunities to complete the various rank requirements and attend trips that HE finds exciting and fulfilling. HE is responsible for informing the Scoutmaster (in advance) of his choice to begin working on a Merit Badge; the completion of which is up to HIM and his Merit Badge Counselor. Through INDEPENDENT work (with a friend or family member - to comply with Youth Protection) he will work with his MBC to complete Merit Badge requirements at his own pace. Periodically, all boys will attend a Board of Review (BOR). Boys advancing to their next rank MUST attend the BOR as a requirement, but the Scoutmaster or Advancement Chair may also schedule periodic BORs for boys who are NOT advancing to inquire as to the reason they are not progressing, or finding out what is "missing" in the Program. Firemen' Chit and Toten' Chip are safety badges and it is at the discretion of the Troop Leadership to revoke a Scout's PRIVILEGES for fire-starting or knife/axe use. Should this ever happen, the corrective process is usually retaking the instructional course. Until that happens, a Scout is not permitted to carry/use a knife, nor may he start or tend a fire. A Court of Honor is a Boy Scouting awards ceremony, commonly held twice throughout the year. At the Court of Honor, Scouts and their families gather for a formal recognition of advancement(s) and accomplishments that have been earned since the last Court of Honor. There are also periods for the Troop's Committee Chairperson to speak on the state of the Troop, or for some other event such as Scouting's annual Friends of Scouting campaign. He's becoming a young man and needs to start interacting with other adults like the Scoutmaster, Assistant Scoutmasters, and various Merit Badge Counselors. He also needs to become comfortable with working without adults hovering over him as he works with his patrol. Having said that, you need to know that this is really the wrong question. Scouting is not a destination. It is a journey. You can fly across the country in a plane, but you will not then experience the richness of our national culture as you would by driving. If your sole goal is to fast-track your son to an Eagle rank, do yourself (and us) a favor by taking your son to a different troop. Our goal is to help make successful, productive leaders out of our sons. It cannot be done quickly, and it cannot be done well with arbitrary deadlines. The average boy will reach the rank of Eagle by age 14 or 15. They have until age 17. 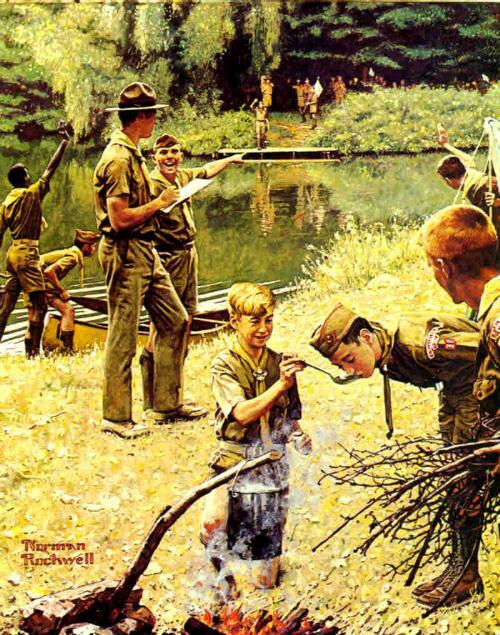 If you believe in the potential that the BSA (and our troop) has to help guide your son, then please do not poison the effort by trying to get him to Eagle artificially at a young age. Those who do it the hard (long) way know the difference - and there IS a difference. Troops that produce young Eagles are generally viewed with suspicion and for good reason. Completing a Merit Badge involves 4 people... The Scout, the Scoutmaster, the Merit Badge Counselor (MBC), and the troop's Advancement Chair. 2 He informs the Scoutmaster of his intention to work on a badge, and is issued a "blue card" and given the contact information for a registered Merit Badge Counselor (MBC). A MBC can be ANY registered MBC in any Council. He is not obligated to work with counselors in his home unit or Council. 3. The Scout(s) contact the MBC and make arrangements to meet as often as necessary to complete the badge requirements (following Youth Protection guidelines at all times). Upon the first meeting, the Scout presents the MBC with the blue card, which the councilor keeps so that he can update completion dates and keep track of the Scout's progress. 4. Upon completion, the MBC will sign all 3 segments of the blue card, and return it back to the Scout who in turn, presents it to the Scoutmaster for final signature indicating final recognition that all work is complete. 5. The Scoutmaster will pass the signed segments along to the troop's Advancement Chairperson who will record the work on the Troop and Council levels, and ensure the Scout is presented with his badge on the next possible opportunity. 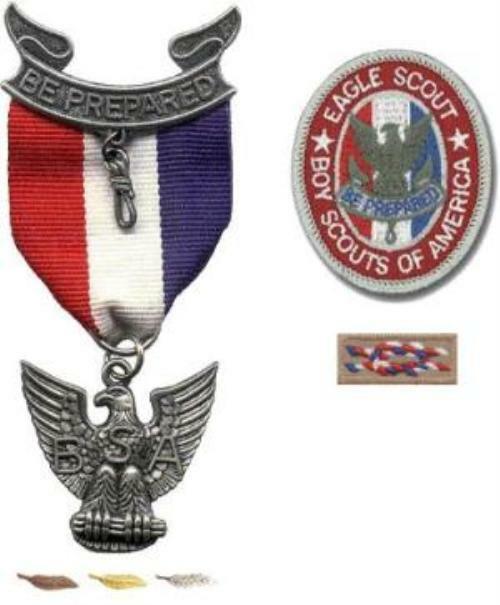 13 of these badges are Eagle Required "White Bands" (merit badges with white/silver border stitching around the edges). The remaining 8 (or more if you choose) may be any badges from among the remaining 115 non-Eagle required "Green Band" merit badges (badges with green stitching around the border). While there are 136 possible Eagle Merit Badges, there are some that are "optional". Refer to the picture to clearly understand which badges qualify for Eagle, and which ones do not. Earning MORE THAN ONE of the optional badges will NOT afford you the choice to NOT earn other required badges, but "extra" Eagle badges can be counted towards the mandatory total of 21. This training is known as the Toten Chip and has a corresponding award of the same name. The award may be the pocket card (size of a business card) or if sold in the Council's Scout Store, a Toten Chip patch. A scout is expected to have his "Toten Chip" with him if he is carrying his knife. If a Scout falls short in his responsibility of safe knife handling, he may lose his Toten Chip privileges and it is up to the Scoutmaster's discretion as to how the privilege can be re-earned. 2. Part of what your son is supposed to be experiencing at camp is becoming a functioning member of his patrol. Therefore, he WILL sleep with his patrol, eat with his patrol, do KP (Kitchen Patrol) duties with his patrol, and perform campfire skits with his patrol. You may watch and advise... but LET HIM "do". 6. Siblings are not welcome to remain at over night excursions, the only exception being 2nd Year WEBELOS scouts, who are actually encouraged to begin interacting with a Boy Scout troop (if our camping agenda is appropriate for WEBELOS-aged boys.). 8. Adults who plan to attend camp MUST inform the Scoutmaster 1 week ahead of time (indicate attendance via email). Once the Scoutmaster is convinced the Scout is ready to move forward toward the next rank, the Scoutmaster will direct the Scout to meet with members of the Committee, where a similar meeting will take place. This is known as a Board of Review. Scouts will arrive at St. John's United Methodist church with their gear. Once all gear is packed and a final check for permission slips and medications is complete, we will depart for the selected camping destination. Upon arrival, the first order of business is to choose camp sites and set up tents. Once all tents are up, kitchen/cook areas are set up and all personal gear is stowed. Then, depending on the time, a meal will be prepared or the boys will have "Cracker Barrel" (snack). Saturday mornings begin with the designated cooks waking up a little early to start preparing breakfast. Once this begins, the rest of the boys generally get up shortly thereafter. Each patrol may have their own dining area, or in the case of a shared pavillion, designated tables. Once KP is complete, there is a flag ceremony and then the Program portion of the day begins with a break for lunch around noon. Program (Scout-skill related activity, and/or the purpose of the camping trip) continues until 5 PM. After dinner, the flag is lowered ceremoniously and there is free time until the Council Fire (at dark). At the Council Fire, boys often perform skits, tell jokes, and enjoy snacks. We generally sleep a little longer on Sunday. Again, cooks are up early to prepare breakfast. Cold breakfasts are encouraged, due to the faster KP time. After KP, all scouts are to gather personal gear and then start packing kitchen/dining areas. The tents are the last to be packed, as it is usually necessary to wait until the tents and ground cloths have dried completely. A tent put away wet will grow mildew and be ruined in a VERY short time. While waiting for tents to dry, the Troop is lead in a "Scouts' Own" prayer service, led by the Chaplain's Aid; a boy appointed by the SPL to lead religous events. Once all gear can be packed, camp is struck and we depart for home targetting a return home by around 12 Noon. What's so special about "Eagle Scouts"? THESE are the highly desirable skills and traits that make "Eagle Scouts" stand out on a job resume or college application, and the fact that such skills and moral foundations are learned/mastered before "society" recognizes him as an "adult"... simply amazing! TYPICALLY, it will take more than 1 year for him to make it from Scout, to Tenderfoot, to 2nd Class, and then to 1st Class. A Scout can work on the requirements for rank IN ANY ORDER, but his actual progression through the ranks must be sequential. A boy has until his 18th birthday to reach Eagle and/or be a Boy Scout. Can I "sign off" on my son's requirements? Golly Toto... we're not in Cub Scouts any more. While all Troops (should) follow the same BSA Program designed by the National Council of the BSA, you will find every troop has a program MUCH different than any other. Some predominantly like to HIKE, others BIKE, some CAMP while others CANOE. Some are "year round", and others take a summer break. Yes... it probably would. But why would we want that? NOW you know... "bigger things" are happening here at Troop 340 than meets the eye.